Fukoaka, Japan and another light airs venue for the America’s Cup World Series. The Cup arrived in its Louis Vuitton case and was wrapped in a duvet – presumably to keep it warm – before being taken to the stage to be introduced to the gathered spectators. Certainly one of the hottest things at the event as with winds that hardly reached double figures the racing wasn’t exactly light speed. Call me old fashioned (don’t be shy, it’s been done before) but the America’s Cup has always been a big boys game and been 1 on 1 with the defender taking part in their own trials not gaining experience and advantage from the gathered defenders. So what of the racing? We found an ideal spot lined up between the sart line, reaching mark & finish line which wasn’t as easy as we expected as the crowd was certainly way above the reported 6,000 tickets sold. Race 1 started in about 7-8 kts with BAR being first out of the blocks with ETNZ close behind and even squeezing into a short lead at one point but Mr Ainslie & crew extended to comfortably cross the line in 1st place only 10 minutes after the start – not exactly a marathon when the AC races used to have 4 mile long legs. Race 2, with winds increased to 10 kts, brought the biggest cheer from the crown as Softbank rounded the first mark in the lead, something they were not to relinquish the whole way round the course. BAR spent most of the race in 2nd last place but nibbled away and just after rounding the penultimate mark threw a cheeky little luff on mate Ian on Artemis to finish on the podium behind Dean Barker on the home team, Softbank. Ainslie & Percy may be mates down the pub but on the race-course they certainly take no prisoners. Oh, and I nearly forgot, they were actually foiling. In the final race of the day the wind once again backed off and code zeros were in evidence downwind and this time it was Oracle’s turn to lead from start to finish but BAR still up there. So day one finished with BAR at the top of the tree after only around an hour od racing. Top not only in Fukuoka but also on the overall leaderboard. Easy to say there were bucket of points available on day two with the three double points races but as the light faded it looked very much like BAR would be the team to head to Bermuda with 2 bonus points waiting for them in the first round robin. Day two dawned with hardly a zephyr. Downtown Fukuoka there was a huge advertising balloon and the cable securing it was depressingly vertical this morning. 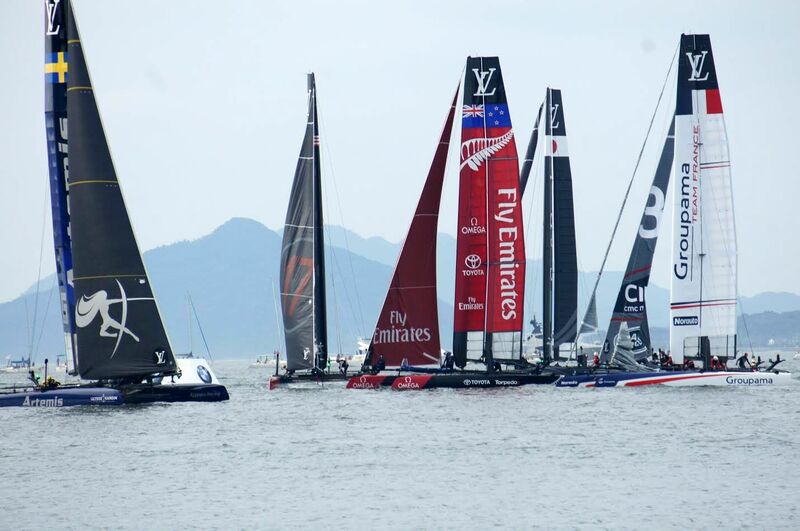 However the forecast was for breeze by the time the teams lined up for the double points races. Day 2 once again started off with a light breeze and Race 4 saw Groupama first off the line but gradually slipping back. They got to the bottom mark first, went left and into a hole to eventually finish last. Honours went to Artemis and Oracle finishing ahead of BAR put pressure on the GBR team at the top of the table. The whole days racing was close and combative with Ainslie handing out more than his share of penalties with perhaps the most important being a luff at the penultimate mark – an almost copycat of the one on his mate Percy the day before. This time Spithill didn’t react quickly enough resulting in a flashing red light on the American boat showing us all the umpire’s decision. BAR slipped through to take the place. It turned out to be an important place change as BAR and Artemis finished the regatta on equal points with BAR taking the event due to beating Artemis in the last race. The event was proclaimed from the main stage at the start of the event to be stadium racing, a term pioneered and effectively achieved by the Extreme Sailing Series (ESS) and I have to say that the OC Sport event achieves this concept in a much more convincing manner. The America’s Cup, as those of us with longer memories can recall it certainly is not. Perhaps rather like Moet-Chandon marketing alco-pops or Rolls Royce producing a family saloon. In my opinion, and it is only an opinion BUT not only mine, the America’s Cup has lost its Unique Selling Point (USP) and it could be viewed as just another catamaran event, just like ESS only not as original. Having said that, in its defence, it is still a spectacle and if the target is to attract non-sailors to our sport then more power to them. Our sport needs to use every means to attract new participants.